The Confederation of African Football [CAF] has named Ghanaian referee Daniel Nii Laryea in a 24-man list for the 2019 Africa Cup of Nations in Egypt. 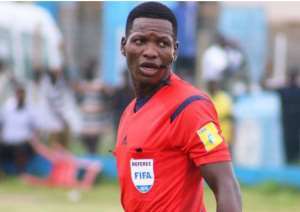 Laryea who holds a FIFA badge has been one of the centre referees used during CAF’s inter-clubs competition. Laryea was among the referees selected for the 2017 African Youth Championship in Gabon and the 2017 WAFU Cup of Nations hosted by Ghana in September.